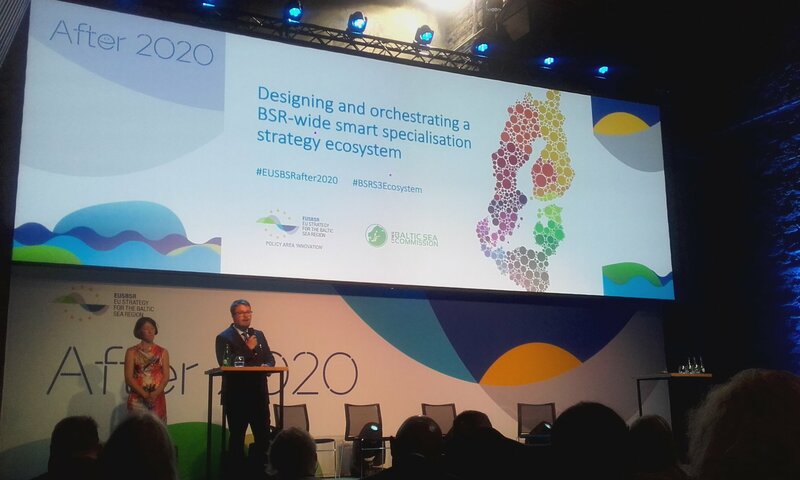 Regional actors and Policy Area Innovation expressed their collective ambition to create a macro-regional Smart Specialisation Strategy ecosystem at the 9th Annual Forum of the EU Strategy for the Baltic Sea Region. This was the key point of discussion at the seminar “Designing and orchestring a Baltic Sea Region-wide Smart Specialisation Strategy ecosystem” on the 4th of June in Tallinn, co-organised by the CPMR Baltic Sea Commission and Policy Area innovation. Regional actors in the Baltic Sea Region, led by Region Västerbotten, with the support of Policy Area Innovation, believe there is great potential to improve interregional cooperation on Smart Specialisation Strategies. Together they have agreed to explore ways to improve S3 interregional partnerships, creating a stronger innovation of scale and allowing new opportunities for economic development in the Baltic Sea Region. Erik Bergkvist, President of Region Västerbotten, stressed during the seminar: “When exploring how to embrace new interregional approaches to Smart Specialisation, we need to build on our success but much of the BSR’s existing S3 interregional efforts are project-focused and timebound activities. We now have the opportunity to reflect on how to better align these efforts to create a more sustainable footing for our innovation partners. The regions within the Baltic Sea Region will come to play a pioneering role in co-creating a macro-regional response to the EUSBSR”. This innovation pilot in the Baltic Sea Region fits well with the European Commission’s proposal on post-2020 Cohesion Policy, published at end of May, which foresees stronger support for interregional cooperation on Smart Specialisation. Alison Hunter, Director of EPPC emphasised the strategic opportunity to create a Baltic Sea Region S3 Ecosystem, in view of a strong S3 EU agenda for the post-2020 period. The seminar provided the opportunity to present ongoing initiatives to make cooperation on S3 more effective in the Baltic Sea Region. Esa Kokkonen, Director of the Baltic Institute of Finland, presented the project BSR Stars S3. Joanna Przedrzmirska, Head of the Project Management Centre at the Maritime Institute in Gdansk, presented the project Smart Blue Regions. Lina Stanionyte, from the Joint Research Centre, presented the S3 Platform and the effort to align S3 projects and instruments in the Baltic Sea Region. To conclude the seminar, Jonas Lundström, Head of Enterprise, Innovation and Social Development in Region Västerbotten, invited all interested actors in the Baltic Sea Region to join the process of creating a S3 ecosystem. Jonas stressed: “The BSR S3 Ecosystem will help enhance the profile of the BSR as an innovation partner of choice within and beyond the EU”. More information on the Baltic Sea Region Smart Specialisation Strategy ecosystem can be found here.